DNA replication is the biological process of producing two same (Identical) Copies of DNA from one Parental or original DNA. The DNA replication process occurs in all living organisms of this world and is the basis, the core, the root for biological inheritance. The replication of a DNA molecule begins at special sites called origins of replication. The eukaryotic cell DNA contains thousands of such replication origins. A protein initiates DNA replication. It recognizes these sequences of origins and attach to the DNA. It separates the two strands. These strands open up to form a replication “bubble”. Multiple replication bubbles are formed in eukaryotes. These bubbles fuse with each other. The replication of DNA then proceeds in both directions and entire molecule is copied. There is replication fork at each end of a replication bubble. It is Y- shaped region. New strands of DNA elongate on these replication fork. An enzymes DNA polymerase catalyzes elongation of new DNA at a replication fork. The nucleotides align with complementary basis on “old” template strand of DNA. They are added by DNA polymerase one by one. The rate of elongation is about 500 nucleotides per second in human cells. The substrates for DNA are nucleoside triphosphate. The nucleoside triphosphate has three phosphate groups like ATP. Each monomer loses two phosphates and joins to the growing end of a DNA strand. Hydrolysis of the phosphate is the exergonic reaction. Therefore, it derives polymerization of nucleotides to form DNA. 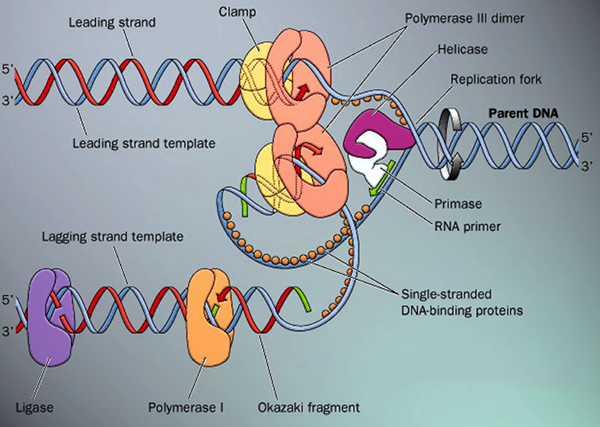 Leading Strand: The enzyme DNA polymerase can only add nucleotides to the 3’ end of a DNA strand. It can never add it to the 5’ end. Thus, a new DNA strand is formed in 5-3’ directions. The DNA polymerase can synthesis a continuous complementary stand along 5’-3 direction. This DNA strand is called the leading strand. Lagging Strand: The DNA polymerase move away from the replication fork elongate in 3-5 strand of DNA. The DNA synthesized in the direction is called lagging. The lagging strand is first synthesized as a series of segments. These pieces are called Okazaki Fragments. These segments were discovered by Japanese scientists Okazaki. These fragments are about 100 to 200 nucleotides long in eukaryotes. There is another problem for DNA polymerase. It can only add a nucleotide to a polynucleotide that is already correctly paired with the complementary strand. This means that DNA polymerase cannot actually initiates synthesis of a DNA strand. Nucleotides must be added to the end of an already existing chain. This chain of nucleotides is called a primer. The primer is a short stretch of RNA. It is synthesized by another enzyme primase. It is about 10 nucleotides long in eukaryotes. Only one primer is required for the leading strand of new DNA. Each fragment must have separate primer in the lagging strand. An enzyme then replaces the RNA nucleotides of the primers with DNA. Another enzyme Ligase joins all the DNA fragments into a strand. Helicase: It is a protein. It causes the untwisting of the double helix of DNA.